We’d love your help. Let us know what’s wrong with this preview of Forget Me Not by Claire Allan. Forget Me Not by Claire Allan is was a psychological thriller that kept me guessing. Elizabeth was out walking her dog when she found a woman dying. The woman had been brutally attacked and it turns out that there was a link to Elizabeth's daughter who had died a few years before. The woman's friends are now in fear for their lives and the police are trying to find the attacker before he strikes again. I enjoyed this book and read it in a couple of days. I will be looking out for more from this aut Forget Me Not by Claire Allan is was a psychological thriller that kept me guessing. I enjoyed this book and read it in a couple of days. I will be looking out for more from this author. Thank you to NetGalley and Avon Books UK for my e-copy in exchange for an honest review. I’ve just finished this fantastic book after falling asleep with it in my hands I didn’t want to stop reading as it came to a heart stopping end. I have read all of Claire’s books and for me her writing is just getting better and better. There are so many great characters in this book and the twists and turns are amazing. The writing is flawless and the pace kept me hooked and had me guessing right to the end ( even though I was completely off the mark when the murderer was revealed. ) What a tw I’ve just finished this fantastic book after falling asleep with it in my hands I didn’t want to stop reading as it came to a heart stopping end. I have read all of Claire’s books and for me her writing is just getting better and better. Warn them we’re the last words spoken by Claire as she lay at the side of the road breathing her last . Elizabeth who made the grim discovery whilst out walking her dog.held her hand and tried to comfort her. But who does Elizabeth need to warn? Who could have inflicted this horror on this young woman.? None of this made any sense to me. The characters weren’t really likable even before the bullying is revealed. The ending is a flash-flood where three non-evil minor characters are revealed to be the same evil person in a way that makes no sense based on the previous storyline and only serves to end the book. Elizabeth is taking an early walk with her dog when she discovers Clare who has been murdered. As she does in her arms she whispers something to Elizabeth. Clare’s friends Rachel and Julie are besides themselves with grief but they also appear to be in danger and how are they linked to Elizabeth? This was a good read and I really enjoyed it. I know my book club will like this one! This is my second book from the brilliant Claire Allan and it was just as good if not better than the first. A twisted and gripping tale that I read in just a couple of days, told from alternating points of view it certainly was a “ page- turner”. I did have a few suspicions about the perpetrator and I was right but the book was written in such a good way that it never spoiled my enjoyment at all. The plot was well thought out, the characters believable but not always likeable but for me that ad This is my second book from the brilliant Claire Allan and it was just as good if not better than the first. A twisted and gripping tale that I read in just a couple of days, told from alternating points of view it certainly was a “ page- turner”. I did have a few suspicions about the perpetrator and I was right but the book was written in such a good way that it never spoiled my enjoyment at all. The plot was well thought out, the characters believable but not always likeable but for me that added to the attraction of the read and the twist at the end was something I hadn’t expected at all. So for me this was a soIid 4 star read and I would recommend it if you want an enjoyable and quick read. Thank you so much to Claire Allan and Avon Books for this ARC in return for an honest review. Elizabeth O’Loughlin lives alone in her farm house with her dog. One early morning when out on a walk, she unfortunately finds Clare, fighting for her life following a brutal attack. Clare doesn’t hold on for long, but manages to whisper her frightening last words to Elizabeth before she slips away. Elizabeth is burdened with this message and knows that she must take action in order to stop anyone else b Thank you so much to Claire Allan and Avon Books for this ARC in return for an honest review. "Warn them." These were the last words spoken by Claire as she lay dying in a ditch at the side of the road. Elizabeth O'Loughlin, the poor old woman who sat beside her holding her hand. But who was Elizabeth supposed to warn and who had inflicted the horrifying injuries to Claire's body. This is the beginning of the latest crime novel from Northern Ireland author, Claire Allan, and oh my god, what a story it is. The writing is flawless, the characters are so real, and I was hooked from the firs "Warn them." These were the last words spoken by Claire as she lay dying in a ditch at the side of the road. Elizabeth O'Loughlin, the poor old woman who sat beside her holding her hand. But who was Elizabeth supposed to warn and who had inflicted the horrifying injuries to Claire's body. The writing is flawless, the characters are so real, and I was hooked from the first page. The story is told in dual point of view so we have Elizabeth and Rachel (one of Claire's best friends). Elizabeth has her own story and is out walking her dog when she comes across Claire. Elizabeth is struggling to come to terms with her own daughter's death two years previous and coming across the murder has a deep impact on her. Rachel is struggling with her own grief too - her mother passed away from cancer - so Claire's death hits her hard. She's also struggling with her marriage. The story unfolds with some fantastic character building and I really felt like I knew these people personally. I tried guessing who the murderer was but I had to keep reading and boy did I get a shock when all was revealed. I wasn't expecting the twists. I wasn't expecting the darkness or the cruelty of the murderer or his tormenting behaviour. Elizabeth, walking her dog one morning, is horrified to find the barely alive body of a woman, the victim of a vicious attack. Clare is only able to whisper a few words before she dies. Rachel, one of Clare’s best friends, is understandably traumatised by the death of her friend. But as it turns out, that’s only the beginning of the nightmare for Rachel. I didn’t really engage with the character of Rachel, which is unfortunate as she’s the main narrator (there are also sections from Elizabeth’s point of view). She just didn’t seem that interesting and I never felt I had a grasp on her personality. I preferred the older Elizabeth, who also has some secrets up her sleeve. The story took me a while to get into but then did become quite an addictive read as I tried to work out what was going on, There was obvious misdirection in play from early on, but I wasn’t at all sure where it was all leading, and in fact it was cleverer misdirection than I thought because when I did think I knew where things were going, it turned out I was wrong. I did guess in the end - but only very shortly before the big reveal. The prologue confused me and I had to think about it a bit to get my head round it. There are occasional clumsily constructed sentences (“DI Bradley had left the room to call the details in to his team that I’d given him”.... huh?) but I read an advance copy so hopefully these will be edited out in the final version. The title’s pretty unoriginal. All in all a good escapist read, cleverly put together and ultimately quite gripping. I’ve only read one other Claire Allan book which I thoroughly enjoyed, so when this one became available on NetGalley, I jumped at the chance to receive an advanced copy. I’m so glad that the first book I read wasn’t a fluke as I think this one was even better. I was hooked from the prologue and couldn’t put it down until I knew who the killer was and why. I liked the seriousness of the book, and that the police were involved and were doing everything they could. So often with psychological thrill I’ve only read one other Claire Allan book which I thoroughly enjoyed, so when this one became available on NetGalley, I jumped at the chance to receive an advanced copy. I’m so glad that the first book I read wasn’t a fluke as I think this one was even better. I liked the seriousness of the book, and that the police were involved and were doing everything they could. So often with psychological thrillers, the protagonists don’t involve the police, and this winds me up. However in ‘Forget Me Not’ this wasn’t a problem. Rachel had a network of people she could talk to, and Elizabeth had her dog! Even though Elizabeth was alone, it didn’t feel like she was isolated and had no one which again is another overused trait of a PT. This book was well thought out, it was brilliantly written, and the premise was perfectly executed. It had me on the edge of my seat throughout. I even wanted to cry in sympathy of the teenage Laura; you could feel her desolate demeanour jumping off the page. I sort of guessed the killer as I was reading it but I didn’t expect the actual outcome of why he was doing what he was doing nor did I guess the connection or the pure depravity of their character. Forget Me Not by Claire Allan is another wonderful thriller by this talented and exciting author. Compulsively readable, and full of shocking twists and compelling characters, this is a gripping read that I simply could not put down. The novel is presented from the alternating perspectives of Rachel and Elizabeth, who are initially linked by an horrific murder. But just how deep a connection these two women share will gradually be unravelled over the course of an intensive police investigation. Ra Forget Me Not by Claire Allan is another wonderful thriller by this talented and exciting author. Compulsively readable, and full of shocking twists and compelling characters, this is a gripping read that I simply could not put down. Rachel, Clare, and Julie are old school friends who have remained close many years later. When Clare is found murdered, ominous warnings suggest that Rachel and Julie will be the next to die. Elizabeth, a lonely older woman, has the misfortune to find Clare's broken body, and bear witness to her final, cryptic words, "warn them". The words themselves mean nothing to Elizabeth, until an investigation reveals that she is linked to the women in ways she could never have imagined. This is a twisty and well-conceived plot that kept me in its grasp throughout. I particularly enjoyed the final twist at the end of the epilogue. It is no less than chilling. I have only recently discovered the writing of Claire Allan, but I am fast becoming a very big fan. for this ARC in exchange for an honest review! Publish date is 5/30/19. While walking her dog one morning, Elizabeth comes across a woman who is barely clinging to life. Just before she breathes her last breath she whispers her final, chilling words to Elizabeth. It soon becomes obvious that the killer is still out there making threats. Can the killer be stopped in time? Like "Her Name Was Rose" by the same author, I found this book interesting while I read it, but there are a few things that spoiled my enjoyment. Firstly the prologue is confusing and doesn't really fit, 'my body was never found' ? Really? The only character I really got to know was Rachel (unless you count Elizabeth and her penchant for banana bread as 'knowing' someone) and even she was superficial. When the reveal comes (I had guessed who it was very early on, although not that he had adopted Like "Her Name Was Rose" by the same author, I found this book interesting while I read it, but there are a few things that spoiled my enjoyment. When the reveal comes (I had guessed who it was very early on, although not that he had adopted an alter ego), his change into super evil villain was a bit like watching the Incredible Hulk grow his muscles and rip his shirt off. I would have liked a bit more insight into his character and relationship with his mother. Also, why (and this is a question for quite a few authors) have the potential victim be warned in advance that they are going to be killed? My thanks go to the publishers and Net Galley for the advanced copy in return for an honest review. This is a well written thriller set in Northern Ireland about 3 close friends who met at school, one of whom is found on the roadside dying. She is found by Elizabeth, a middle aged lady who lives on her own not knowing at this early stage the ramifications of finding the woman will have. I thought this was very well plotted and certainly a page turner. I sort of guessed who the perpetrator would be early one which took the sting out of the tale a little but it certainly grabbed me through to the This is a well written thriller set in Northern Ireland about 3 close friends who met at school, one of whom is found on the roadside dying. She is found by Elizabeth, a middle aged lady who lives on her own not knowing at this early stage the ramifications of finding the woman will have. I thought this was very well plotted and certainly a page turner. I sort of guessed who the perpetrator would be early one which took the sting out of the tale a little but it certainly grabbed me through to the end. Forget Me Not is Claire Allan's third psychological thriller. Having read and loved Her Name Was Rose and Apple of My Eye, I was thrilled to have been gifted an e-arc of this book. Told in the alternating voices of Elizabeth (who finds Clare's body) and Rachel (Clare's friend), who are linked initially through the murder of Clare, Forget Me Not is a fast paced and suspenseful read with secrets a plenty. I did guess the murdered but that didn't take away from my enjoyment of the book. 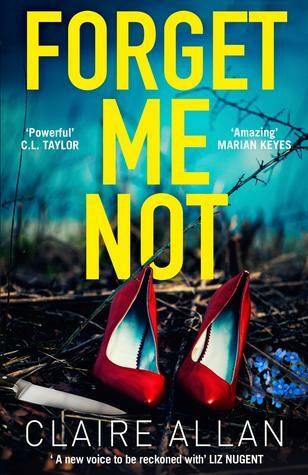 I read this Forget Me Not is Claire Allan's third psychological thriller. Having read and loved Her Name Was Rose and Apple of My Eye, I was thrilled to have been gifted an e-arc of this book. I really enjoyed this read, my first from Claire Allan. I have another on my Kindle ready to start now. It was an easy read which kept me interested throughout as I eagerly read on to discover the identity of the perpetrator. Admittedly I had no idea at all who was guilty. The style of writing appealed to me, it was easy to follow, not too taxing and flowed well. The language used throughout want too complex and was well connected so that the plot flowed and kept me interested in all that would I really enjoyed this read, my first from Claire Allan. I have another on my Kindle ready to start now. It was an easy read which kept me interested throughout as I eagerly read on to discover the identity of the perpetrator. Admittedly I had no idea at all who was guilty. The style of writing appealed to me, it was easy to follow, not too taxing and flowed well. The language used throughout want too complex and was well connected so that the plot flowed and kept me interested in all that would transpire. I love a good psychological thriller and this ticked all the boxes. Ultimately a story of friendship, the desire to be liked, accepted and included. Touching on the relationship between mother and child and husband and wife. A tragic tale of one characters suicide and how those who loved her dealt with her loss. Lives changed in a bid to get justice for her. A twisty, gripping and enthralling read. This book was predictable and really dragged on. I skipped through a lot of the irrelevant details, and the main characters weren't likeable enough to keep me caring in their fate.. I also thought Molly should have been a four-year-old with how she could communicate. A minor detail, but I don't think a younger child could have conceptualized what she did. Claire Allan's Forget Me Not is a page turning thriller destined to be the perfect summer read. Told in Dual perspectives we learn about the murder of a middle aged woman how the ties that connect the two characters. Forget Me Not had me fully engaged from the first page to the last. I cannot wait to read more from Claire Allan. I found this to be a good read, it kept me guessing all the way through as to who the killer was, I had made several guesses before getting it right. I like the style of writing and will be reading more by this author. Read in a day so it's certainly engaging. I enjoyed the writing and the twists but found the prologue confusing. As an aside, I loved the old 90s cultural references. I would read this author's work again. I read this In one sitting as I had to know who was responsible for the death of their friend. It’s a thrilling chase of a book which kept me changing my mind from one page to the next over who was responsible and what would happen next. I thought this was a really well written psychological thriller. It did take a little while to pick up, but once it did I couldn't put it down. I had so many theories running in my head as I was reading. The characters were hard to relate to at some points which is why I only gave 4 stars instead of 5. Thank you to Claire Allen and @netgalley for the ARC of Forget Me Not. At 6am on a summers morning Elizabeth is walking her dog when she comes across Clare, the victim of a knife attack, Clare dies moments later, but not before she tells Elizabeth something. I enjoyed this book, well written and nice fast pace. I did pretty much figure out what was going on, but that didn't take away from the book as I was still unsure.